ASIDE from promoting sports, the province of Capiz will host the #TRIAKSYON: 1st Capiz International Triathlon on April 22-23, 2017 to showcase their culture, traditions, and tourist spots. The two-day swim-bike-run event is expected to gather more or less 300 participants around the world. 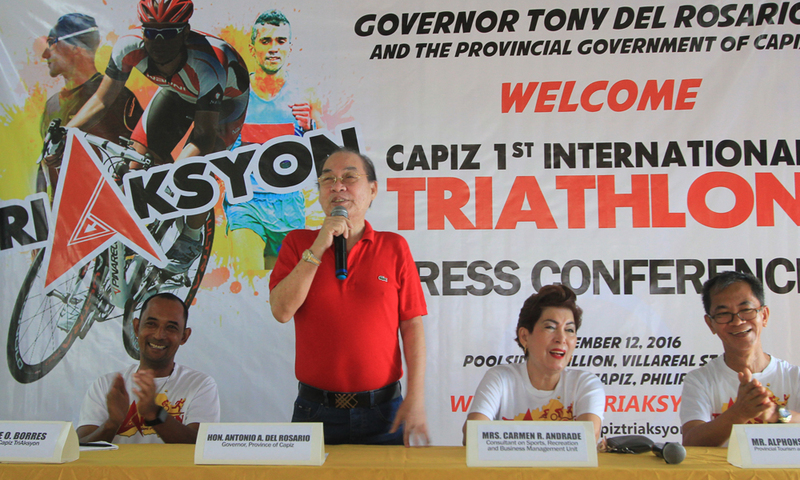 During a press conference at the Poolside Pavillion of the Villareal Stadium in Roxas City, Capiz last Dec. 12, 2016, Jose Borres, Capiz Triaksyon chair, said they came up with the triathlon event because it is now a trending sports. “We are happy to inform everyone that this activity will serve as promotion of Capiz being the ‘Seafood Capital of the Philippines’ and let other people around the globe know that Capiz still exists and has a lot to offer,” he added. The event will feature age group – Trikids, Sprint, Standard, and Relay. Borres also said that international triathlete Betsy Medalla expressed her intention to grace the affair. Gov. Antonio Del Rosario also said the activity will put Capiz in the world map, given that athletes from other Asian countries such as Singapore, Malaysia, Hong Kong, among others, had confirmed their participation. “This event was suggested by our people to attract tourist arrivals in the province. This will give Capiz the opportunity to showcase its place, attractions, hospitality, and seafood,” Del Rosario added. Provincial Tourism and Cultural Affairs Officer (PTCAO) Alphonsus Tesoro said they are now raring for the much-anticipated international event. “We are doing our best to accommodate all the participants during their stay here. In fact, we have 1,197 individual hotel rooms that offer quality service to our guests. This is one way of making people aware that Roxas City and Capiz is now ready to host various national and international events,” shared Tesoro. #TRIAKSYON will have a grand launching in January 2017 and will mount press conferences in Iloilo and Manila to attract athletes and promote the first ever international sporting event in Capiz.